If you’ve visited our products page, you may have noticed that your new Vertical Organic Garden Starter Kit comes equipped with not only a pH testing kit, but also special formulas designed to adjust the pH of your garden. Some of you may remember from high school chemistry classes that pH is a scale that measures the acidity or basicity of a solution, but why is it such an important part of growing a healthy garden? This blog will serve as a refresher course on what pH is, as well as explain the function of pH in your garden. PH stands for “potential of hydrogen,” and in the purest of science terms, refers to the hydrogen ion concentration of a water based solution. The pH scale ranges from 1 to 14, with 7 being completely neutral (neither acidic nor basic), any number below 7 being acidic, and any number above 7 being basic. Basic solutions are typically slippery to the touch, with a bitter taste. Soap, bleach, and ammonia are all basic solutions. Acids give more of a ‘stinging’ feeling, and taste sour. Lemon juice, Coca Cola, and Hydrochloric acid are all acidic solutions. Pure water is completely neutral, and in fact most city water is balanced so that it comes out of the tap at a pH of 7. PH testing is performed using a litmus test, which can either be a liquid solution, or litmus paper. Litmus refers to a special blend of dyes extracted from lichen that change color in different pH levels, which lets you easily see the pH of whatever solution you are testing. Typically acids (low pH) will show up as red, and bases (high pH) will show up as blue. So why is pH so important to gardening? Just like humans, plants need specific nutrients to grow strong and healthy. However, these nutrients can only be absorbed at certain pH levels! The wrong pH level will cause too much or too little of a nutrient to be absorbed, which will cause either nutrient deficiency or toxicity. 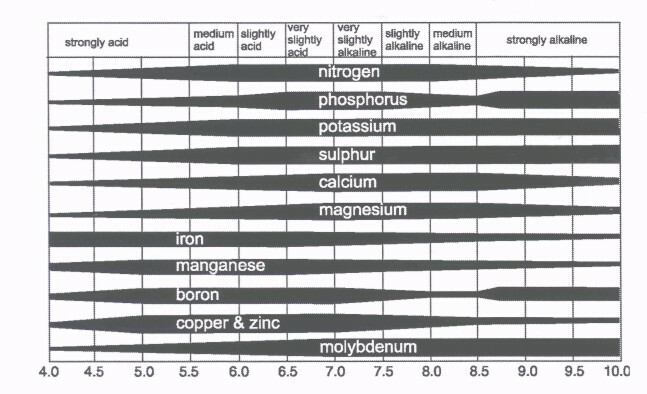 Most plants are happiest in a slightly acidic environment, where pH is between 5.5-6.5. Most fertilizers take this into account, and are acidic, so that when they are mixed into water – for example in the reservoir of the Vertical Organic Garden – they will lower the overall pH to an appropriate level. If the water in your garden is too basic, it will cause something called nutrient lockout: a total inability of the plants to absorb nutrients, even when there is lots of fertilizer in the water! Because nutrient deficiency and nutrient toxicity result in the same plant symptoms – yellow or dying leaves, stunted growth, brown splotches on the leaves – it is important to test the pH of the water in your reservoir before attempting to fix the problem on your own. Luckily, pH is very easy to adjust, and changes almost instantly! PH UP and PH DOWN are available at most home and garden stores, as well as specific hydroponic stores, but are also included in your V.O.G. starter kit! The most common pH adjusters are limestone to increase basicity, and sulfur to increase acidity. If you’re in a pinch and need to lower your pH, a splash of lemon juice will do the job as well! What are you waiting for? Get gardening!